In true mathematical spirit Dean Ulf Nilsson opened Valla Library, now the only library on Campus Valla, with the words “HumSam + TekNat = Sant” – a play on the schoolyard declaration of love, suggesting that the combination of the two libraries produces the truth. Since the beginning of the year Campus Valla has had only one library: Valla Library, after TekNat closed and moved in together with HumSam in D Building. Twelve tons of books have been sorted through and 7,000 metres of shelf space have changed place. 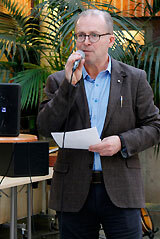 And to emphasize even more strongly that TekNat has now moved into D Building, it was of course Ulf Nilsson, dean of the Faculty of Science and Engineering, who got to officiate at the opening. 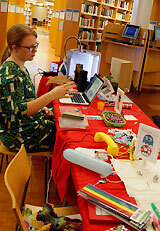 The whole event took place in Valla Library, an event that is planned to recur annually on Valentine’s Day, 14 February. But the day contained much more than inauguration speeches. 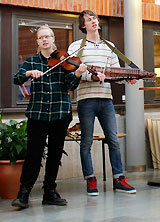 When the “Lunnekvintetten” folk music troupe from Lunnevad Folk High School struck up in the main hall at lunchtime, people gathered on every level of the building to listen. A little further into the library the ICT studio was holding Makerspace, with the digital image in focus. It was illustrated using perler beads, which symbolically can be likened to digital pixels – a way of linking together the digital and the analogue. During the day a couple of lecture series also began: ‘Riveting research in fifteen minutes’, a collaboration between the Faculty of Science and Engineering and the library; and ‘Forty-five minutes in the library’, a lecture series about digital communication, media and business intelligence.